These two policies I regard as a solid bedrock that both LCC, and any other cycling campaigns that choose to follow its example, can use to assess which schemes are acceptable: which genuinely provide the "space for cycling" that we are asking for: space that is both subjectively and objectively safe, usable, and inviting. They lay down clear standards that cannot be escaped from or wriggled-out of: in particular the 20mph and 2000 PCU criteria. Of course, they do not fully specify what quality cycle provision looks like; that would be impossible in the wording of a short motion to be debated at a meeting. The full explanation of the "Protected Space for Cycling" policy may be read here, but that is only three pages and still can't be a full explanation of what we are campaigning for. We know there will be many other factors at play in determining whether cycle provision and cycle routes will be successful: factors of directness, priority, efficiency, legibility, social safety and overall quality. We know the treatment of junctions is critical, and this policy does not attempt to go into that at all. We can't lay down in one policy a set of design standards. Transport for London is producing a new set of design standards currently, and I await to see what they say (word is that they are a major advance on previous standards). But the policies enshrined in LCC's Motions 3 and 5 do represent, I believe, a real leap forward in terms of campaigning clarity, vision and ambition. In fact there was little opposition in the AGM to Motion 5. There was a concerted attempt by anti-infrstructuralist (and now re-elected Board member) Oliver Schick to derail Motion 3. He first tried a procedural ruse, claiming that because the full explanation of the policy had not been included with the AGM papers (as it was available on the web), it could not be voted on. This argument was quashed by the Chair. (It was noted that the accounts had been approved by a vote, even though those were not in the AGM papers either.) He then tried to replace the carefully-considered argument of the "Protected Space" policy, which differentiates between the functions, and necessary treatments, of main roads and side-streets, with a simple call for 20mph everywhere, without a call for protected space anywhere. The meeting had the good sense to reject this approach overwhelmingly. However, the workshop session in which I took part in the afternoon, on "Protected space on main roads" revealed a level of misunderstanding and doubt amongst many in the campaign about the policy as it applies to main roads. I think we will have to adopt wordings in the future that leave it beyond doubt how "protected" and how "dedicated" the space on main roads for which we are campaigning needs to be. 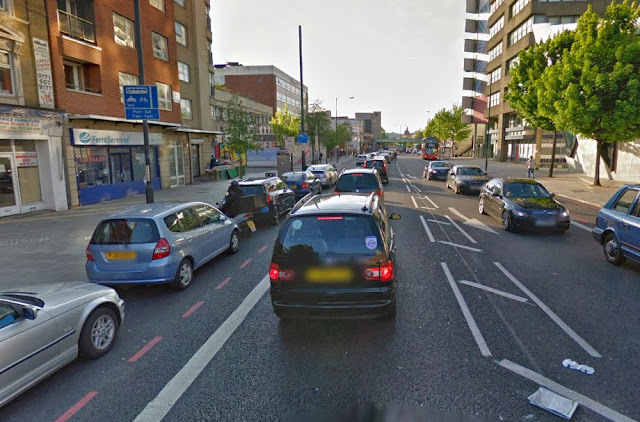 Shared bus lanes are not "protected" or "dedicated" space for cycling. Advanced Stop Areas are not protected or dedicated space for cycling. (Indeed I believe we should start to generally oppose Advanced Stop Areas on major, multi-lane roads as they are not an appropriate or helpful facility in these places.) Protected, dedicated space means that other vehicles cannot drive or park in the space. It has to be physically segregated using kerbs, wands, bollards, "armadillos", planters, or some such engineering. The protection must continue through junctions, with separation of conflicting traffic flows in time (vehicles not allowed to turn left across the path of straight-ahead cyclists; straight-shead vehicles not allowed to conflict with right-turning cyclists). The principles are well established, and coverage on Camden Cyclists' website and that of Paul James (the in-aptly named Pedestrianise London) goes into many details. A variant of "dedicated space for cycling" on Royal College Street, Camden. The claim particularly amused me as an Outer Londoner as it was as if some people had never been to Outer London, and imagined it to be a more leafy version of Dallas, Texas. In fact, most of the main roads in Outer London are the remains of old village High Streets, or lanes that once connected London's orbital villages, and have far less obvious potential to segregate-off cycling than do the capacious boulevards of the West End (Park Lane, Portland Place etc.) or the main arteries of Inner London like Holloway Road. Yes, there are exceptional big roads in Outer London, but there really isn't a pattern of "more road space" being generally available there. If anything, the space ripe for "easy" reallocation is in the centre, where the Congestion Charge, parking restrictions, and general policies making it more difficult to drive and park, including those in force only during the Olympics, have reduced motor traffic and the pressure on road-space. Holloway Road is actually a classic example of the type of road that must get segregated cycling provision if we are to ever achieve a double-digit mode share for cycling in London. However, a current consultation from Transport for London for a stretch of this road, covered in detail on As Easy As Riding A Bike, proposes, sadly, a load of rubbish again: 1.5m wide advisory cycle lanes just outside parking and loading bays, leading to Advanced Stop Areas which provide nothing useful in terms of subjective or objective safety. Please do respond, telling TfL that this is totally inadequate, here. 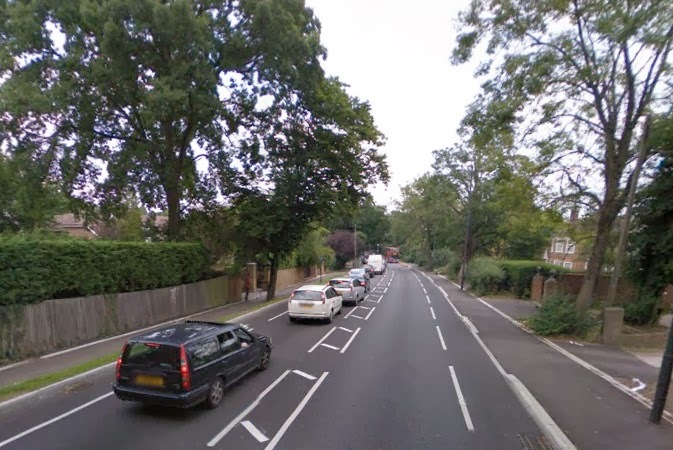 We now have a policy which says clearly that on a road like this, where traffic flow is far above 2000 PCUs a day (this equates to about 1.4 vehicles per minute on average), we need truly protected space. And we need one protected space (or one for each direction) for all cyclists on this alignment: no more fobbing us off with the line: "Experienced cyclists can use the road (or unprotected, toothless, advisory cycle lanes) while nervous cyclists can choose other routes", in other words, "We won't give you any material change from the status quo". We've got a policy, and that's what it is, a policy; we can't force change. But if enough people say it enough times, the message will get through. This is what we need to start to make London a city truly fit for cycling in. We must ask for what we really need, and, in particular, for what those who currently are far too frightened to cycle on our roads – the vast majority of Londoners – really need. In July 2011 I wrote a post calling on cycling campaigners to stop asking for "Poor scraps dropped from the Big Man's table – the Big Man, of course, being the hegemony of the motor car". My main example was a set of requests for Advanced Stop Areas and painted lead-in lanes on a main road (Piccadilly). I asked for campaigners to look beyond what they felt was "politically possible" at any moment, but to move political possibility forward, with ambitious demands based on the experience of what infrastructure has actually worked in places where mass cycling has been achieved: to set the proper standards, and keep asking for them, and not deviating. I also asked campaigners to promote better, more comprehensive and radical visions for how our streets could be completely rearranged, with visual material that could be used to demonstrate to public and politicians not particularly interested in the subject of cycling what real, transformative change to our urban spaces, to benefit everyone, would look like. Making the case for other streets will become easier because a really high-quality scheme will (a) get new people cycling, (b) remove conflicts with pedestrians and (c) provide a visible subjectively safe place that will tempt people out of their cars. The result is that people elsewhere will say ‘I want that here too’ – i.e. create a demand. (Compromise schemes don’t create that demand.) Then it won’t just be us asking for it, it will be pedestrians, the disabled, ‘ordinary’ cyclists, even drivers, even rural councillors maybe. So I go back to the theme that I developed in 2011, articulated here again by Martin, that though compromised cycling provision can appear in the short term to be a "politically achievable" objective, campaigning for it is mostly a waste of time, as it can't generate a visionary movement that snowballs with the public, and never achieves a breakthrough. It looks to me that, led by various bloggers and the Cycling Embassy of Great Britain, cycle campaigning in the UK has moved into a phase that is realistic because it is radical, and radical because it is realistic. Another aspect of this new radicalism is a willingness of cyclists and associated pedestrian and disability activists to engage in publicity-grabbing direct action in order to draw attention to the policy demands. The first London "Die-in" occurred outside TfL HQ in Southwark on 29 November. The next will be held at Vauxhall Cross this Thursday morning. If you can, do consider going along. You can sign up on the Cyclists' Requiem Protest Facebook page. We've got a clear policy, but we see with the Holloway Road scheme, and numerous others brought forward in recent months, that Transport for London and the boroughs are still producing, mostly, appallingly compromised, near-useless or positively dangerous schemes for cycling, despite the promising words of The Mayor's Vision for Cycling, published nine months ago. The pressure on them needs to be intensified in every way possible. "cycle campaigning in the UK has moved into a phase that is realistic because it is radical, and radical because it is realistic. " Great post, especially " that though compromised cycling provision can appear in the short term to be a "politically achievable" objective, campaigning for it is mostly a waste of time, as it can't generate a visionary movement that snowballs with the public, and never achieves a breakthrough." I have a scheme on a main road which is currently signs'n'paint and was up for a review. Conventional thinking was to tweak the signs'n'paint because there is "no space". I stopped this approach and we are designing properly, including starting to look at junctions and closing some side roads to traffic. In the currently political climate, it won't get the funding we need, but we have the start of a proper job on the shelf. I think my peers need to take this approach and either to a proper job or not at all and that in itself is a challenge. 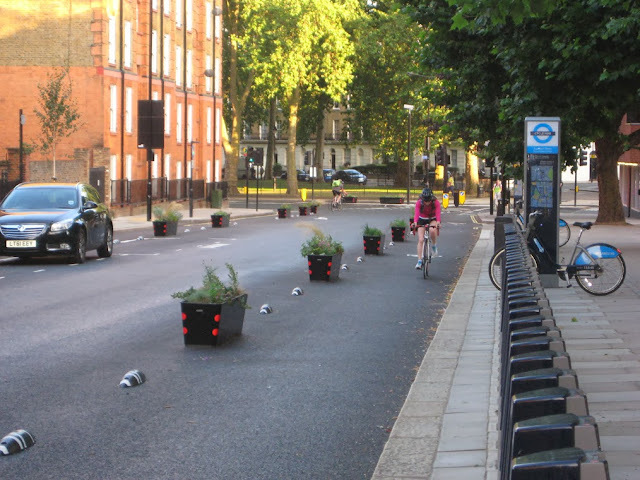 Yes, I was talking to Brian Deegan recently, designer of the Royal College Street scheme and editor of the new London Cycle Design Standards, and he expressed the view that engineers in future would be much more reluctant to work on poor-quality schemes. I hope he is right. I should correct you: 2000 PCU/day means 200 PCU per peak hour. And that means one car per 18 seconds passes cyclist.